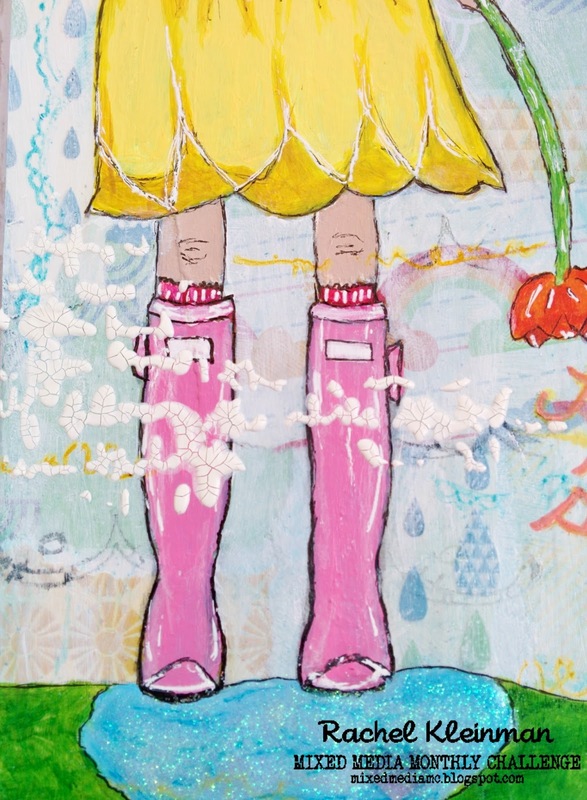 We want to see your mixed media projects that are all about rain... think rain boots, umbrellas, clouds, dew drops, lightning, rainbows... just use your imagination and be creative! 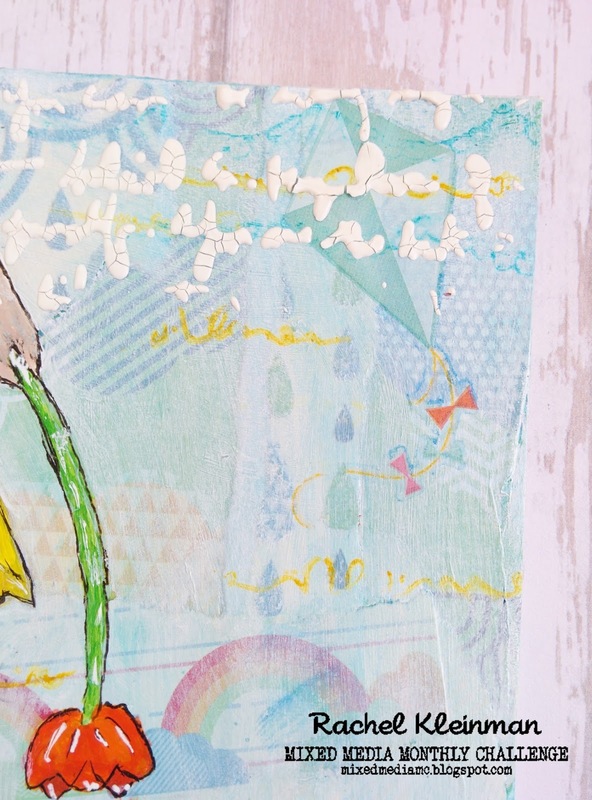 You have until April 30th to add your project to our gallery! 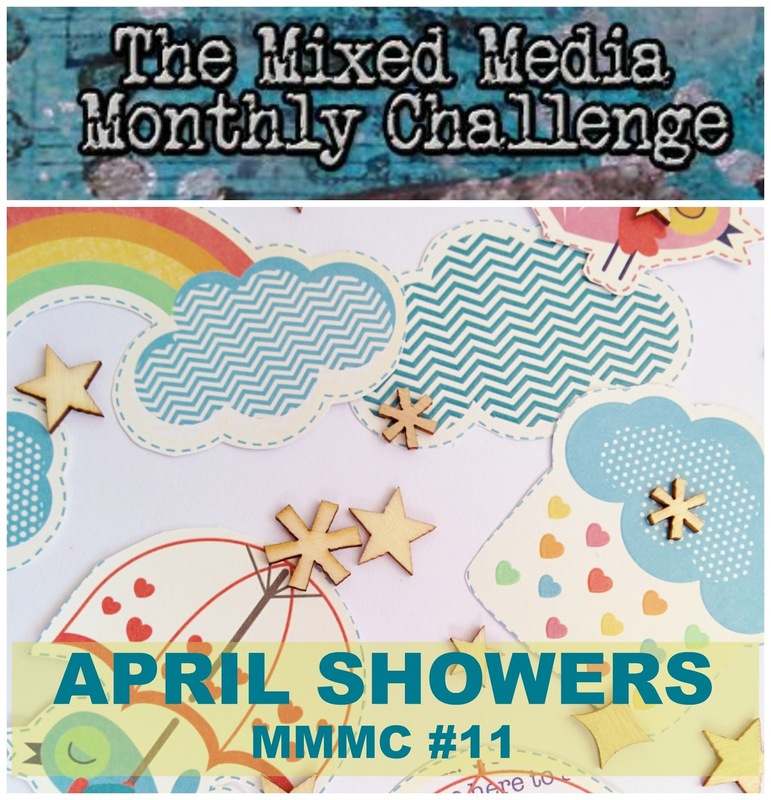 MMMC has a fantastic sponsor and THREE PRIZE PACKS up for grabs this month! Thank you to DECO ART for all the amazing products! 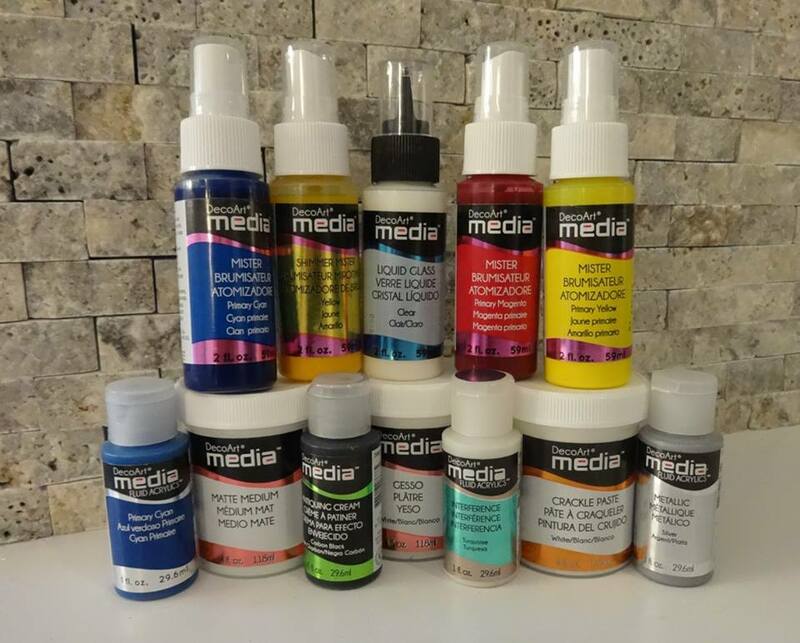 The prize includes tons of products from the new DecoArt Media line... gorgeous acrylic paints, permanent mists and sprays, crackle paste, gesso, metallics... it's a fabulous prize!! Good Luck! Now onto my project. 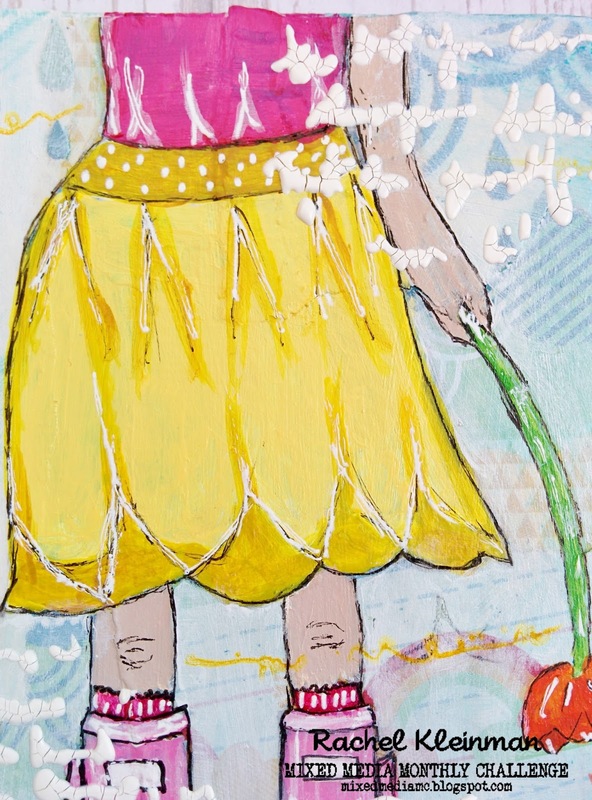 I finally put a Boot Girl (class from Christy Tomlinson) to a canvas. woohoo! 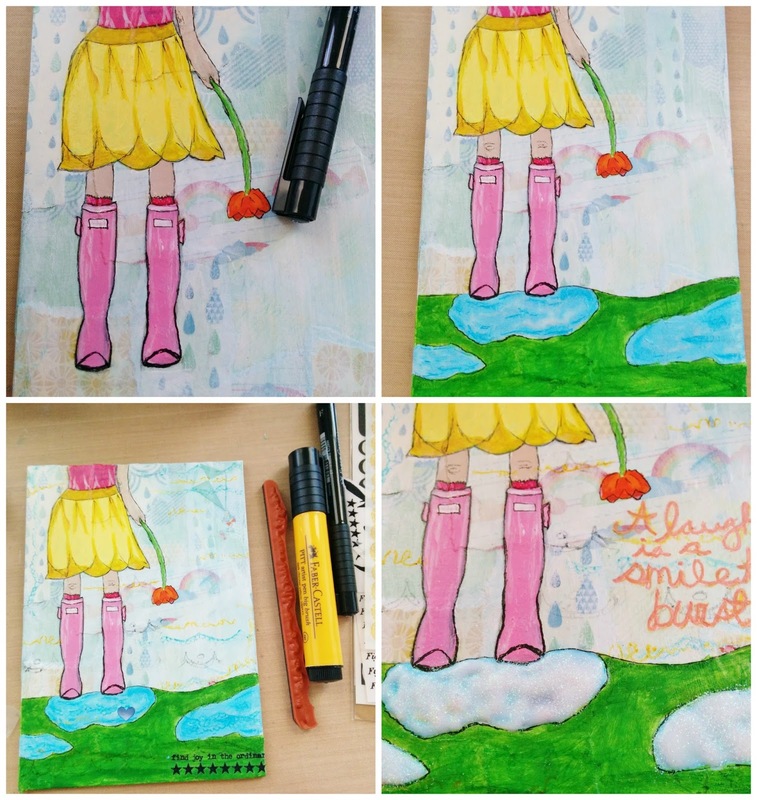 - I started with a sketch I did several months ago in my journal. 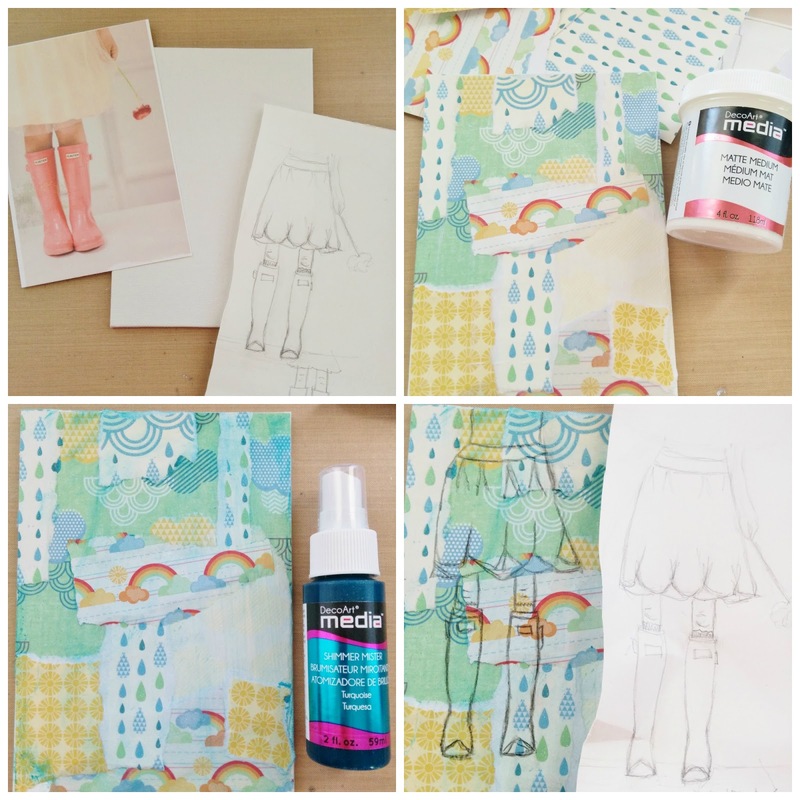 - Then I grabbed some super appropriate patterned papers from the DCWV "Sky's the Limit" stack to collage my canvas board. 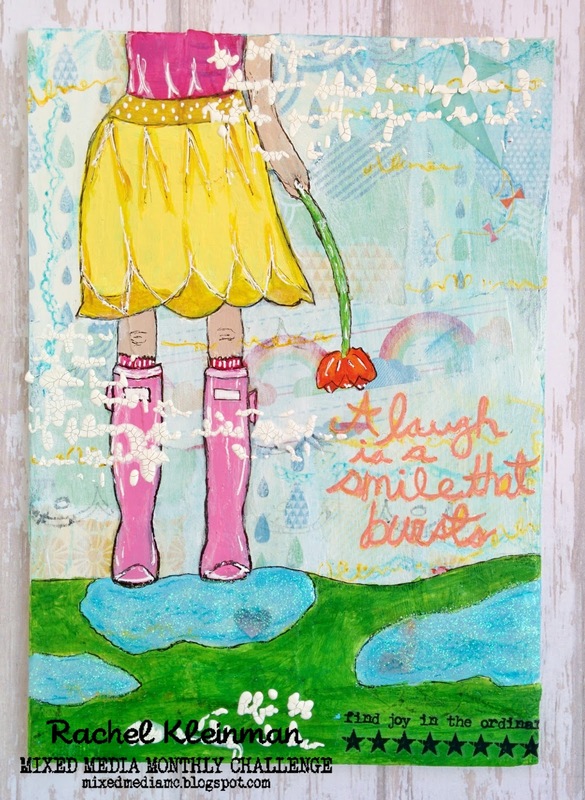 I used DecoArt Matte Medium to collage everything. - Once it was completely dry I added some of the Turquoise DecoArt Spray. I rubbed the paint with a baby wipe, giving the canvas more of a 'blue wash' look. - Then I sketched on my canvas with a Stabilo black pencil. When I started painting, I first painted a layer of Titanium White acrylic paint to give a base for any color I added. 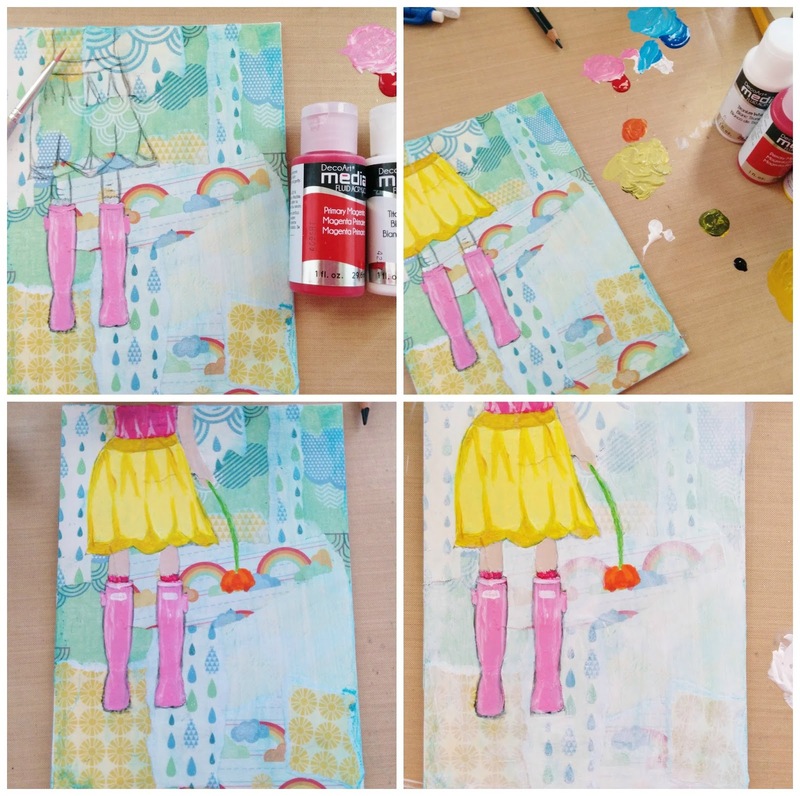 The acrylic paints come in Primary colors, which makes mixing custom colors so much easier! - Once my girl was painted, I did a white wash over the background. I did this by mixing the Titanium White paint with some glazing medium, then wiped it off with a baby wipe. 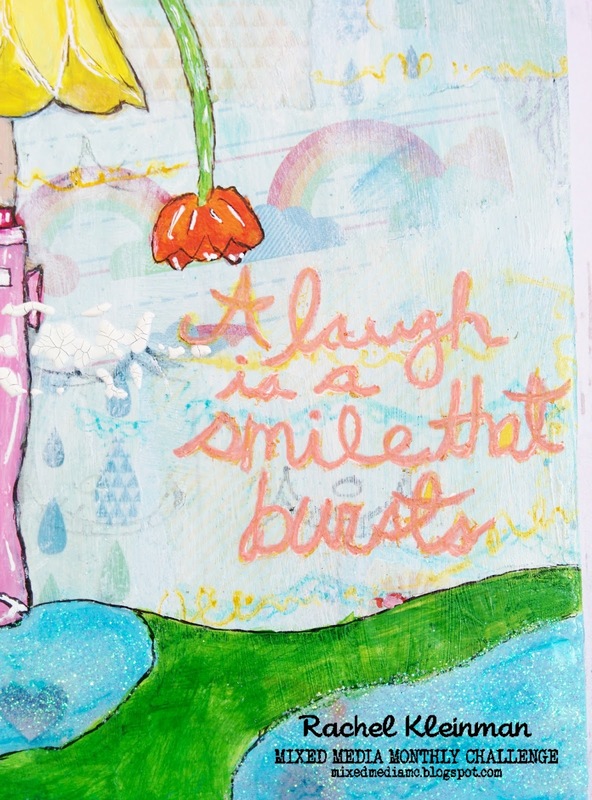 Lastly, I used some DecoArt Crackle Paste through my new favorite stencil (The Crafter's Workshop "Mini Believe Script") and drew in the sentiment. Thank you for joining me! These MMMC posts are always fun ones for me to share! Make sure to see what the rest of the designers created at the MMMC blog! And a huge huge THANK YOU to DecoArt for the fabulous products... I will certainly continue to use them! 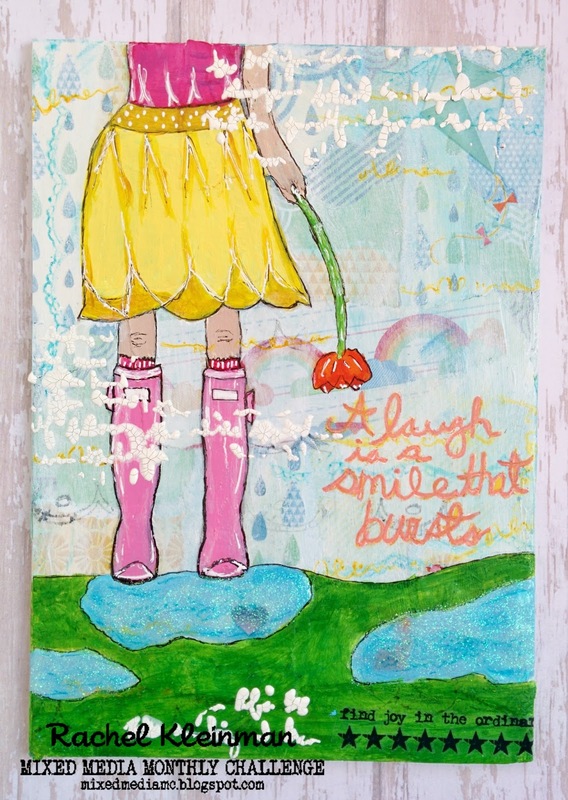 Now link up your mixed media April Showers project to our gallery! Have fun! Wow, your work just blows me away! JUST LOVELY!!! What a fab inspiration! LOVE it, glad we will be in the same team at TCW from 1st of May! This is fabulous! I love how you took a picture and made a sketch and it all came to life! Great drawing and the puddles are a great touch! Thank you for sharing!